Echosounders calculate water depth by measuring the time it takes for the acoustic signal to reach the bottom and the echo to return to the ship. Image Credit: DOSITS. The product is divided by two because the measured time is the round-trip time (from the transducer to the seafloor and back to the transducer). The faster the sound pulses return to the transducer from the ocean floor, the shallower the water depth is and the higher the elevation of the sea floor. 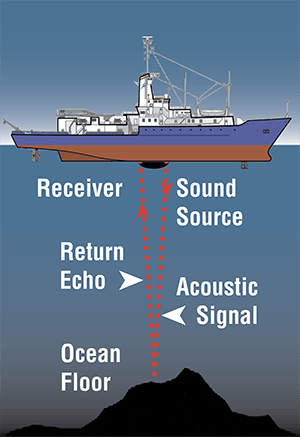 The sound pulses are sent out regularly as the ship moves along the surface, which produces a line showing the depth of the ocean beneath the ship. This continuous depth data is used to create bathymetry maps of the survey area.